– The best books can be enjoyed over and over again. 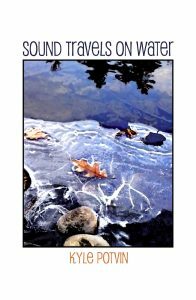 Kyle Potvin’s chapbook Sound Travels on Water is one such book: a satisfying collection of poems with nuances of meaning that emerge on subsequent readings. Potvin writes about ordinary moments: cooking soup, rocking a three year old to sleep, eating burnt toast, a high school reunion. Even washing laundry! Her everyday subject matter becomes remarkable and illuminating with her expert grasp of poetic forms and the elements of poetry. In the darkened room, I find him waiting. a warm wool scarf pulled hard and tight for skating. In this poem, Potvin provides a master class for how motherverse should be written: clear, simple adjectives; a metaphor that is comforting, yet certainly not clichéd. Moreover, in this and other poems, she evokes a specific setting. She doesn’t just say, “I was putting my son to bed one night,” but takes time to describe a scene rich in details, a moment that is wistful and tender. Moreover, her skill as a crafter of sonnets is obvious here, too: words that rhyme but are not forced. “Furtive Lullaby” follows the English sonnet’s rhyming pattern: abab cdcd efef gg. I enjoyed reading Potvin’s poems for the emotional experience but also for the intellectual exercise of analyzing her formal poetry. It is challenging to create sonnets that read naturally yet fulfill the demands of that form, but Potvin makes it look easy. The villanelle and blank verse are other forms in this chapbook, as well as free verse. despite the mild fall weather. that their car does not overtake me. My favorite poem in the chapbook was the title poem, “Sound Travels on Water,” in which Potvin describes moments of gratitude at breakfast. This short, free verse poem celebrates the beauty of ordinary moments—even the beauty of burnt toast. The smell of burnt toast is delicious. The first drag of coffee is sweeter. Even small, insistent voices are pleasing. I loved the last lines, the contrast of the sight of the lake “drawn down” in winter but still “more than half full.” While this poem is written from the perspective of a cancer survivor, it is an anthem for anyone who has overcome difficult situations in life. Potvin’s poems are marvelous. They can be read and appreciated for the literal experience described: the essence of a moment. Then, read as assured metaphors for overcoming challenging situations, and gratitude for moments of safety, hope, and resiliency. I look forward to reading more of her work. 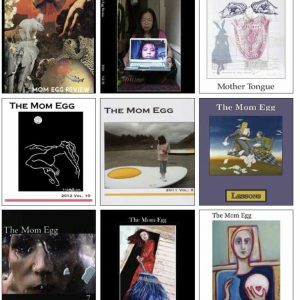 Nancy Vona is a regular contributor to the Mom Egg Review. 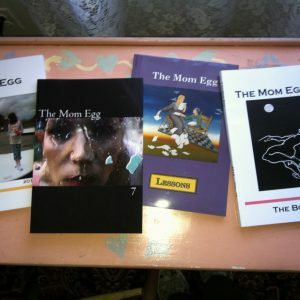 She has published poetry and non-fiction, and lives in Massachusetts with her husband, two energetic boys and three spoiled dogs from various dog rescue groups. She’d like everyone reading this review to buy, right now, one literary journal or volume of poetry. And then another to give to a friend.